Here you will experience the finest Japan made facial & decollete spa. You’ll find your skin more softened, circulated, with deep relaxation. The luxury pure gold mask makes beautiful skin. Facial lifting up: The effect which makes the big eyes and makes the skin bright. 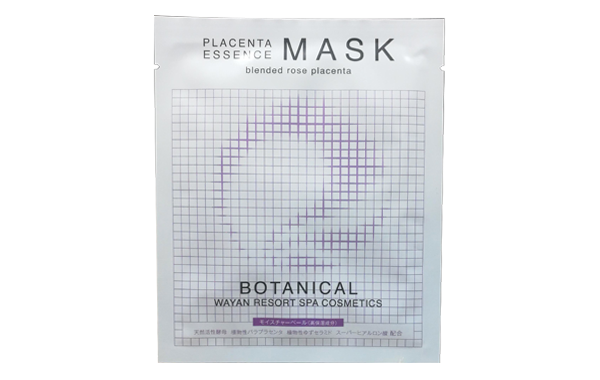 Click “LIKE!” on Facebook, and you will get a PLACENTA ESSENCE MASK (1 / ¥1,200 Tax excl.) for FREE!! We have our own products “WAYAN RESORT COSMETICS”,You can buy only in WAYANSARA. The makeup remover which brightens your skin. Can be used with extention. Low irritative lotion for sensitive skin.Leave the skin hydlated, glowing. Smooth texture, highly powered with Vitamin C derivatives and Botanical oil. The effect of the essence is whitening and pore cares. A botanical soap with essential oils. Gree color from Chlorophyll, which kills bacteria on the skin, prevent wrinkles. The essence approaches a stem cell and promotes skin revival. Our anti-aging solution. There is a high whitening effect on the seat mask including the beauty ingredient luxuriously. Hand massage ehich lift up the face line. Neck and shoulder are carefully massaged, improve circulation, alliviate stiffness, relieve tention. Make your jawline sharpend. Improve circalation of decollete. You'll find collarbone more clear. Special cleansing liquid gently removes dark make and leads it to the clear eye. Botanical face foam washes inside of pores and leads to silky-smooth skin. Natural ingredient 100% Soap washes mildly while keeping the skin moist. Wrapped in the fragrance of the pleasant aroma, deeply relaxed. Facial cellulite will be removed carefully by a special massage. 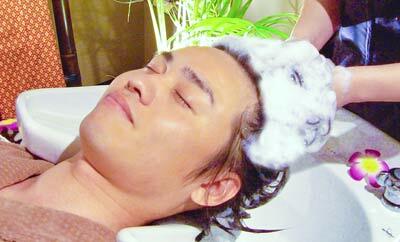 Ear massage which improve blood circulation and metabolism. The effect of the pure gold mask is detox, whitening, face lift up and the deep relaxation. The vitamin C and the hyaluronan included in aqua collagen gel makes a clear skin. Finally, mild and high-quality UV cream leads to a clear skin. And the UV cream has a whitening effect and can be used for sensitive skin.